Designing a look can turn into a quest for the latest trend and a trek across the Internet universe. Lists, budgets and designer names swirl through your head. This might be a good time to stop and catch your breath. Countless objects fill the home, but its most valuable asset is your heart. The concept of designing your home to encourage love and laughter might seem unusual, but it’s worth putting down the paint chips and exploring the idea. If you approach the spectrum as something that matches a new bedspread with the carpet, your combinations are limited. 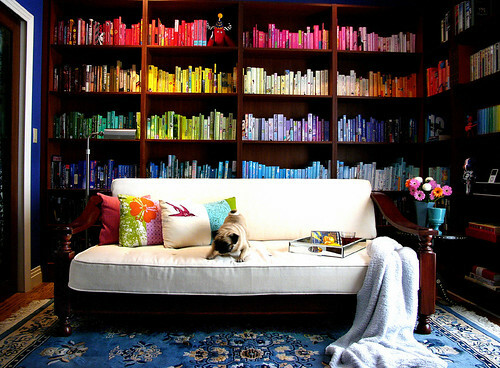 Choosing hues that make you happy takes the chore out of color matching and puts better possibilities into play. It’s liberating to break the rules, so follow your smile. The color wheel doesn’t recommend a match between your carpet and the bedspread that you really want. Ignore the advice because the new bedspread will give you more pleasure than following a paper guide. Color psychology is fun to play with, but it’s not a science. If you want pure white walls, you should have them. Set yourself free from the constraints of convention with the colors that make you happy. Imagine the pleasing patterns on a grass mat, a soft touch of chenille or the charm of silk flowers. All of these things feel as good as they look and are springboards to decorating with your heart. Bare feet are happier when they pad across a comfy stretch of seagrass. A luxurious throw across the end of the couch combines textural contrast with an invitation to a well-deserved nap. Permanent arrangements of your favorite flowers bloom anywhere that suits your mood, moving from one room to another when it strikes your fancy. Take the idea of your decorating touch literally because it feels good to kick off your socks, snuggle up, and change the scene. The walls of your home surround your world, and they should reflect the things that make you happy. A large canvas works over the couch, but if it doesn’t fill you with satisfaction, it’s just filling in a blank spot. If you smile when you see a beautiful fly fishing scene or a framed fine art print of Koi fish, you should indulge yourself. Family photos may be someone else’s kitsch, but those radiant faces fill the house with love. They belong on the wall along with anything else that brings you pleasure. Buying framed art prints cheap encourages you to splurge a little more, and switch between abstract and classic; choose something bold and wild or in soft shades of a framed Chinois graphics print. All in all, it’s easy to try new things and surround yourself with images that speak to your heart. Standard decor tips are based on sound ideas, but they aren’t always your ideas. Breaking the rules is liberating, satisfying and self-indulgent. Decorate your home for yourself, not by another person’s guidebook. Choose colors that make you happy, stay in touch with what makes you feel good, and let your heart be your guide. You’ll always live well in a home that reflects your love. Ann Bailey is an artist and redecorates her home often, usually by moving pictures from wall to wall. Artismo online reproduction company offers framed art prints cheap enough to easily experiment with, and you can add to any mood by simply bringing in some new art!